The immense advances in technology have made our lives much easier. We can do banking on our cell phones, order food to be delivered to us, communicate to anyone, anywhere from our phone or computer. However, the side-effect of this is that we now move less. We sit a lot for long periods of time. We drive to work. Sit at a computer all day. Drive home. Sit in front of the TV. Then go to bed. Our physical activity levels have dropped dramatically and research is starting to show the alarming effect this is having on our long-term health. Studies are even showing that even for people who fit in an hour of exercise a day, if the rest of their day is spent sitting for long periods, their metabolic health is still compromised. There is much research indicating that ‘sitting time, TV time, and time sitting in automobiles increases premature mortality risk’. Meaning that sitting too much could quite literally be killing you. So how do we counteract this when our lifestyles have evolved to the point where we work more than we play? The answer is simply to move – move more and move often. Even if you are a busy executive with no time for actual exercise. You just need to get a bit creative. Put technology to good use and use a smart watch or activity tracker to track your daily steps and aim for 10 000 steps a day. Start a friendly competition with your work colleagues to track your steps and see who can walk the most in a day, or arrange group walks at lunchtime. Link this to your medical aid and earn active rewards at the same time. Boardroom meetings are notoriously long and boring, so why not take a meeting for a walk. Even if you do not leave the building, walk and talk. Apart from the benefit you will get from the added movement to your day, the exercise may even spur on some fresh ideas. If your work environment allows, try prop up your computer on a stand or a higher desk so you have to stand at your desk rather than sitting. Take it one step further and set up your computer on a treadmill set at a low speed and move while you work. Set a timer to go off every 30 minutes and make a point of standing up. Even if it’s just to stretch a bit, or to take a walk around the office. Download an app to remind you, there are many different ones to try including F.lux and Awareness or even Posture Man Pat which monitors your posture through your webcam. 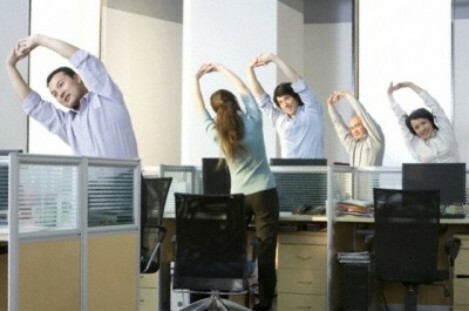 Everyone has to go to the loo sometime, so make it your active break time. Take the long route to the loo via the stairs and do 10 squats and 10 push-ups on the basin every time you go.